The gaiwan has been the preferred vessel for brewing and serving tea in China since the Ming Dynasty. It can be used to brew tea prior to transfer to smaller gungfu-style cups or the tea may be sipped directly from the gaiwan. 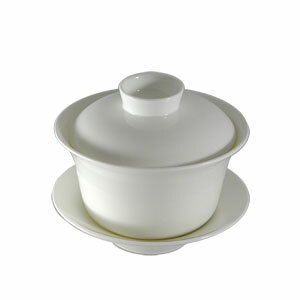 The Bana gaiwan is a classicly simple design, comprised of a tea bowl, a saucer and a cover. It is made of refined alabaster-white bone china that is strong and highly translucent. Clean and unadorned, this piece is finished with a clear glaze.